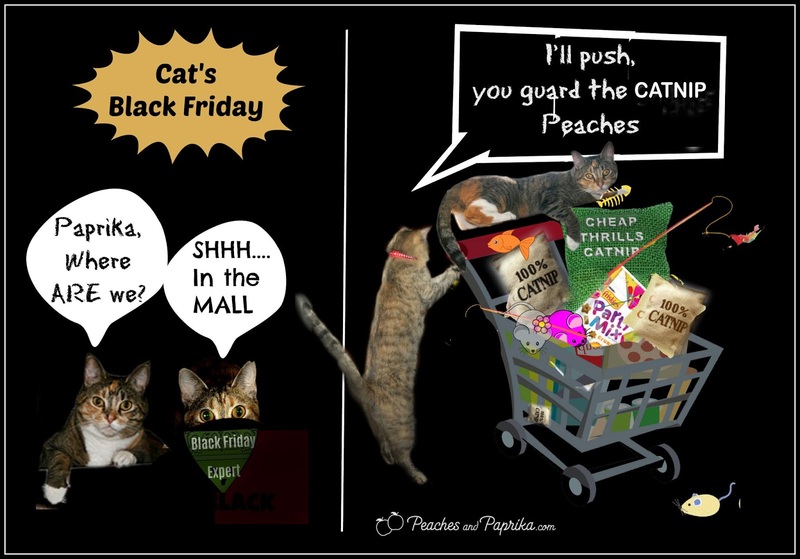 Peaches and Paprika: Black Friday for Cats! I'm glad you got everything you wanted and no you're not going to get arrested. No one arrests kitties. I hope you don't get arrested, but glad you got everything you wanted. Hi and thanks fur your nice comment! We love all your pictures but for some reason our browser will not let us comment on your blog. We're having similar troubles with other WordPress blogs. We plan to update soon so hopefully that will be solved! Will Angels Eric and Flynn fly down and bail us out if we do? Thank U for visiting and for such a creative suggestion!! You better hide that nip! Terrific cart of goodies you two! Hi Guys! Happy belated Thanksgiving! And what a cool thing to do...Ninja an I would join you, but Black Friday is over...darn!